Have you ever sat down and tried to read Leaves of Grass? No offense to the Great Gray Poet, but it's a labor of love. A nice cold glass of wine and a verdant hillside help immensely. Unfortunately, there is neither wine nor hillsides in an urban classroom. But fear not! These handy tips will work even if your classroom isn't in Camden, which mine is. Ask them, what do you have to do to get a bridge this big named after you? Then tell them that this bridge is named for a poet. It floors them. 3. 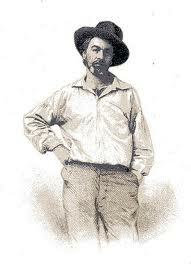 Show them this engraving from the first edition of Leaves of Grass. ... and explain how "proper poets" dressed in those days. Let them connect the dots to today's rappers. 4. Make good use of the trendy Volvo commercial from 2017. 5. Or this really good little confection! 6. Go for the easy poems, like "O Captain, My Captain" and "Miracles." News flash: Have you read "I Hear America Singing" lately? Most of those jobs have either gone belly up or have been outsourced. 7. Memorize some of the poems and speak them without notes while the students follow along reading. They love it when you get stuck or screw up and they have to prompt you. Then, when you have those lil puppies hooked, fling harder poems at them for analysis. In a nice think-pair-share environment. All the while, pray fervently that your last observation of the year will not happen during this lesson -- but be prepared for yet another lackluster mediocre score if it does. Hi there, buckaroos! It's me, Anne Johnson, back from being president and safely in civilian life again! I could have stayed at the White House forever, since it's so much more lavish than my own humble home, but after this latest horrible school shooting, I decided I was needed more at the Vo Tech. What, really, is more important than caring for our vulnerable teenagers? New Jersey has some hella strict gun laws (another reason to love the Garden State), so I'm pretty doggone sure my school administrators aren't going to hand me a pistol and send me to the firing range. And that's a good thing, because I will quit my job if they start bringing guns into my school. If I couldn't find one of those compelling jobs, I would do anything that provided a meager paycheck. ANYTHING rather than having a gun in my hand in a classroom! I'm not pretending to speak for all public school teachers here, but as for me and my classroom, we will follow the path of peace. No. Damn. Gun. I'm exceedingly pleased to be able to report that the Philadelphia Eagles have won their first Super Bowl. As an essentially lazy person, I have most often cheered on the teams wherever I happened to live. My home since 1987 has been the Delaware Valley. Therefore, with varying degrees of enthusiasm, I've rooted for the Iggles. It's just easier, you know? The last time the Eagles won a national championship, I was one year old. Alaska and Hawaii had only been states for a year. The game wasn't even called a Super Bowl. Oh sure, the Eagles have been in the Super Bowl a few times, but they never won it before. On Sunday night they looked so damn fine. Sports are a great unifying force for communities. When a team does well, it bonds people. 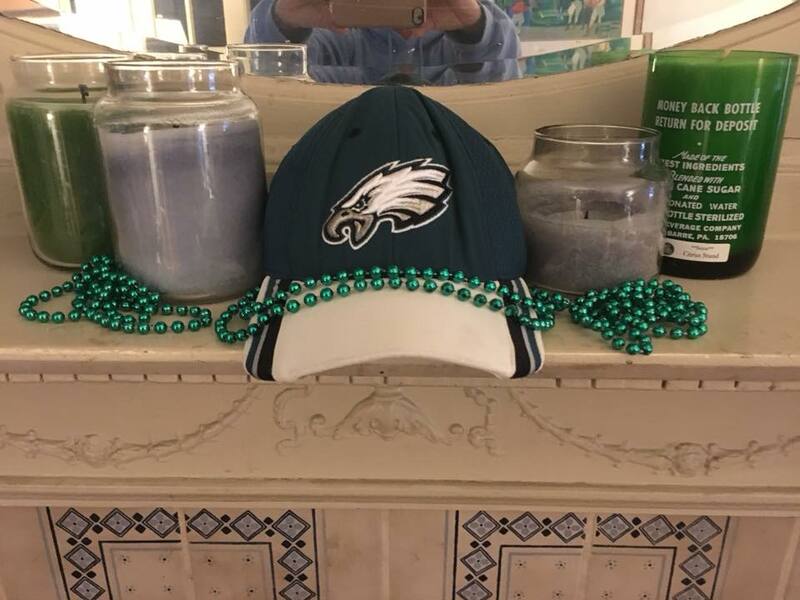 On Sunday my next door neighbor, all in her Eagles regalia, brought me dinner. I gave her and everyone at her party a set of green beads. At the moment of victory, all the doors on my block flew open, and everyone spilled into the street. We wisely didn't climb the light poles or stain the furniture, but we sang and cheered and lit a few sparklers. It made me feel young. My students were happy as well, the boys especially. Today's lesson consisted of analyzing the Super Bowl commercials for their persuasive techniques. Put another way, we watched the best Super Bowl commercials in class. No one complained! The city is throwing a parade for the Eagles on Thursday. I'm not going to that. I know, I know ... you're saying, "Anne. Get real. You're missing a parade?" Yes, I am. If I can't be in it, why go? Congratulations, Philadelphia Eagles, on a great season! Anything that brings us all out of our houses on a cold winter night is a-okay with me.